Whilst Chimerica, World of Extreme Happiness, and even the Fu ManChu Complex received a good level of press attention, they were not the only productions which graced the stage in 2013; stage being a rather grand term for the dias constructed in the middle of China Town’s New World Restaurant, to host the bite-sized pieces of East-Asian theatre put on at by the Yellow Earth Theatre. 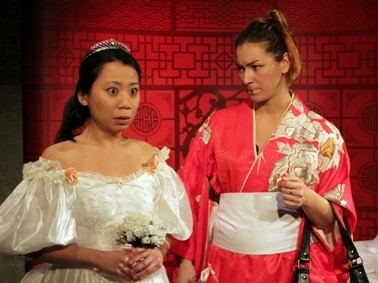 As we munched on dim sum snacks, drank tea and listened to the Director’s introduction, we are immediately thrown into the twisting pieces as a tearful bride burst on to the stage, bewailing her tragic fate of being jilted at the altar. So begins the evening’s opening piece, Butterfly’s Wedding. The audience are recast as wedding guests, in front of whom, Butterfly continues her conversations with her friends and bridesmaid, about her past hopes and present fears. Jeremy Tiang’s punchy and funny script explores some poignant aspects of the East Asian mentality, from the need for face saving, to attitudes of parenting as Butterfly dreams about becoming a tiger mother, a la Amy Chua, to the constant desire to economize as Butterfly tries to eat all the wedding food she’s already paid for, and the fact that many overseas Chinese have lost touch with their culture. The latter is thrown to the forground, as we find out that the Madame Butterfly themed wedding was Butterfly’s attempt to be in tune with her culture (an incongruity that Tiffany, her bridesmaid, highlights). Prejudice against mainland Mandarin speakers is pithily satirized when Butterfly’s friend Tiffany corrects her pronounciation of the dress designer, “it’s Vera Wang not Wong”, at which point Butterfly immediately assumes she must have been sold a knock off. Butterfly’s story is returned to, between the four bite sized plays, the performance of which, are apparently the booked entertainment for the wedding banquet. And there is a happy conclusion, but Butterfly’s role as compare keeps the levels of energy high, and creates a gradient change in tones between the pieces. Of the four pieces that were on offer that evening (a different combination from a larger Menu, were performed each night of the run), the two which really stood out to me were Shuang Teng’s How To Not Please Your Mother, and Sherry Shihui’s The Salt Monkey. The first, set in a restaurant, follows Emma, a British Chinese university student, who is helping her mother in her spare time. Conflict is sparked off when a young Scottish writer asks her out on a date. He attempts to impress her by his knowedge of Chinese culture, which she has rejected. This leads to a conversation between Emma and her mother when he is gone. I thought the pushy, manipulative and snobbish attitude of the mother could not remind me more of the attitudes I have found in my mother’s generation, and highlights the extent to which overseas Chinese have begun to use their heritage as little more than tools, rejecting it for Western lifestyles when convenient, gripping it harder when Tradition aids them. Race and racism are subtle tones to the piece, from the “yellow-fevered” writer, whom Emma suspects is interested in her Chineseness rather than her self, to her mother’s warning not to get involved with anyone black, for fear of having “weird looking babies”. The Salt Monkey is a piece more about the Chinese in China, the rise of real estate, and the increasingly bizarre struggle between generations, with the abnormally fast development of their country. The fact that characters are not identified by names but roles within a family, is an interesting approach to creating an “everyman” situation. The play shows changing attitudes to family, with the grandmother being far more willing to support and help her grandchildren than her own daughter, seeing her commercial minded proactive attitude to be a phase, and not suitable for a girl. The daughter herself rejects the familial ideas of support, and her husband’s new found spirituality. The piece is, on the whole humourous (breaking the 4th wall and asking “why are we talking in English if we are really Chinese?”), kinetic, and fast paced. It’s conclusion though, was a damp squib, signifying that the rich torrent of ideas had dried up before an ending had been reached. As a construct of pieces by East Asian artists, from backgrounds that clearly favour clerical and medical achievement over artistic endevour, there are running jokes about the Arts. Butterfly expresses relief that even though her fiancée is late for the wedding, that he is at least not an actor. Emma’s mother warns her against potential suitors who are writers and artists, words she utters with disgust. I fully believe the writer’s sentiments are sincere, as I myself have gone through similar disputes with my family about giving up a career in finance in favour of literature and Chinese culture. Attending discussions at the Fu Manchu conference, the lack of opportunities on stage and screen for East Asian actors was discussed. If we change the negative attitude to the Arts, within the East asian community, there will be a larger pool of writers, directors and producers, creating more plays on East Asia, and more roles for East Asian actors. Funded by the arts council, Yellow Earth provides assistance on script writing and artistic direction for East Asian writers and directors, who can still source their own producers and cast. Dim Sum Nights is an annual event with short runs, and is only one part of Yellow Earth’s varied and interesting output. Check out their website for more details.